One of the most striking things you notice when you walk around Barcelona is its fabulous architecture. Most of the Barcelonians just walk on by, completely oblivious--or accustomed?--to the beauty around them. 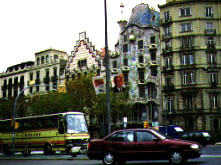 In this photo, you can see the Casa Amatller and the Casa Batlló sitting side by side along the busy main thoroughfare, the Passeig de Gràcia. The Casa Amatller was designed by Puig i Cadalfalch, the same architect responsible for the Pointed House (Casa de les Punxes) among many other Barcelona landmarks. Casa Batlló, of course, is Antoni Gaudí's creation, and has many of the undulating surfaces and animal imagery present in much of Gaudí's work.